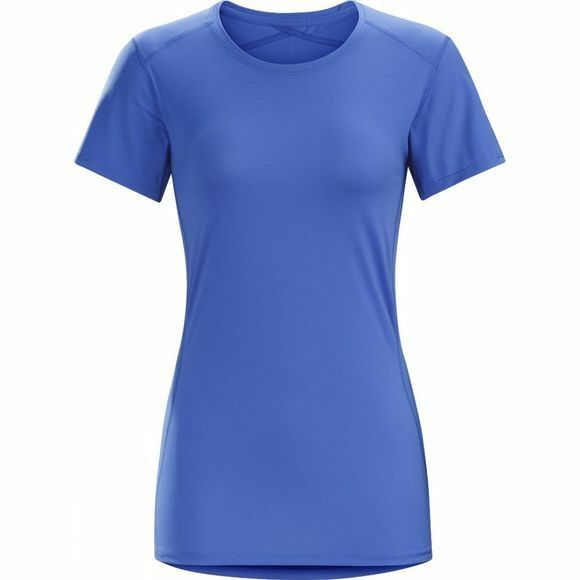 Created for high output in hot weather, the Arc'teryx Women's Phase SL Short Sleeve Crew uses a combination of materials and Arc'teryx' Hybrid Mapping technology to provide effective moisture transport and ventilation. In the main body, Endogauge fabric moves moisture, dries quickly and provides a high level of comfort next to your skin. A back panel made from Endoligh micromesh improves airflow for better cooling and evaporation. Both materials are exceptionally light in weight, and combine with the minimalist design to keep the top's weight at a mere 100 grams. Each seam is strategically placed, then sewn using flatlock construction. This minimises irritation that otherwise may occur during extended, active training sessions. The taller collar provides coverage, and the deep V-neck zip can be quickly released for rapid ventilation. The regular fit stays close enough to your body to maximise the fabrics' performance but provides room for airflow and freedom of movement. A small zipped pocket sits on the back where it is easily accessible yet out of the way.